Monday April 17 1911 It was a fine day but I have such a cold I did not feel like working so sewed on a dress for Mother. Tuesday April 18 1911 Will and I were down to Rob & Coras for dinner. I was over home awhile. Mother about the same. I came up town for some things and home at 5.30. A cloudy day. Wednesday April 19 1911 Weather colder. Will working about the place I was sewing for Mother all day. My cold is much better. Thursday April 20 1911 I washed a few things this morning. Will got help to plant potatoes It was a fine day. I cleaned cellar in the afternoon and helped Will work in the garden. 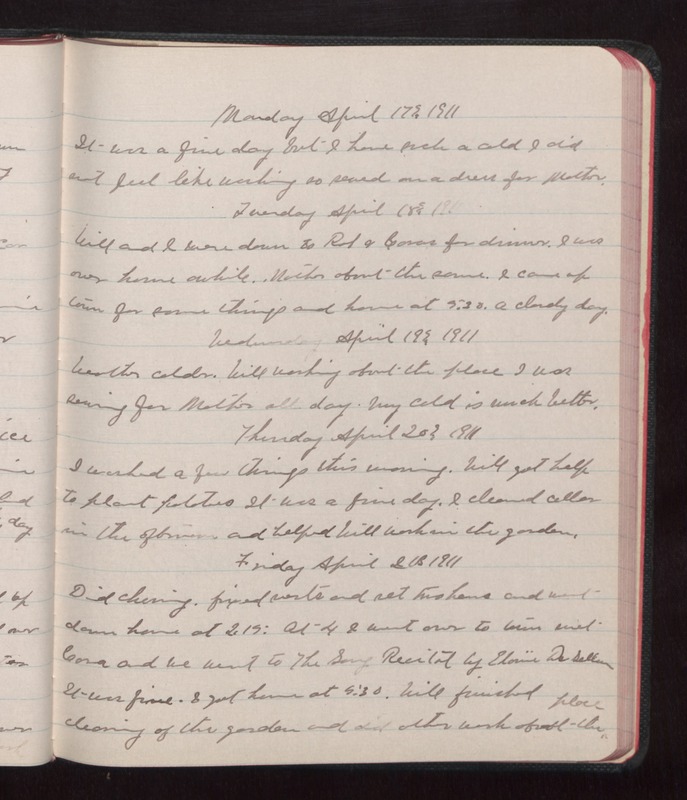 Friday April 21 1911 Did churning. fixed [illegible] and set [his hens?] and went down home at 2.15. At 4 I went over to town met Cora and we went to The [Song?] Recital by Elouise De [Sallum?]. It was fine. I got home at 5.30. Will finished cleaning of the garden and did other work about the place.